No, you can't. Not even when he has spent four years in central Kansas going to college, five years in western Kansas teaching school, and the last thirty-three years in central California. His roots to Minnesota are deep and strong. 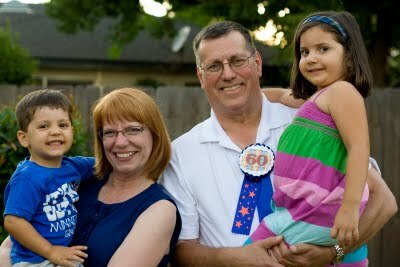 Mark celebrates the big 6-0 today. 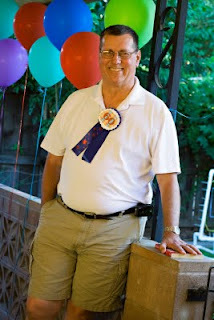 On Friday night, we surprised him with a Minnesota State Fair-themed party, the perfect theme for this Minnesota guy. 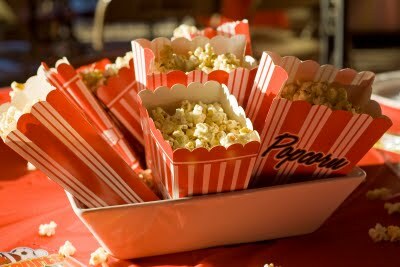 Christa and Jill dreamed up this idea and all the details. They need to go into the party-planning business. We had state fair food, and true to the Minnesota State Fair (which is awesome, by the way), nearly everything was on a stick (corn dogs, apples and chicken kebabs). 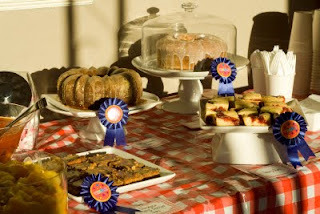 Kettlekorn centerpieces, the "home arts" section with Minnesota hot dish (aka casserole),and blue-ribbon-winning desserts. We even had a Midway: ring toss, ball throw, etc. Aaron had come up with a 20-question quiz, 10 questions about Minnesota in general, 10 questions about Mark specifically. You know, things like "what is the population of Butterfield?" (Mark's hometown), "who is a current presidential candidate from Minnesota? ", "what is Mark's favorite food?" And the winner, also a Minnesota native (so he should know these things), won the grand prize of...a can of Spam, of course! He received lots of funny cards, and some gifts that really touched his heart. Aaron and Christa know he loves to cook and got him this amazing cutting board. See that little heart down at the bottom? That's the approximate location of Butterfield. My dad has done woodworking as long as I can remember. Lately he has started making ink pens on his lathe that begin as a block of wood. And a surprise came in the mail from our special friend who takes some of Mark's favorite photos. She lives in a town not too far from his hometown and keeps him supplied with pictures of that snow that he misses so much during the winter. This special book of Candy's photographs was a surprise to us both. It was an evening of fun, food, family and friends, all celebrating the milestone birthday of my very best friend. Happy birthday, Mark! What an awesome party! Couldn't have been done up any better!! Happy, happy birthday to a super-special friend! Always stay as YOUNG as you are! Fantastic! My husband is from Hershey PA and I've been trying to talk him into moving back for years. Guess we'll be in the south for a while since he hates shoveling snow. Happy Birthday Mark! Hope you enjoy a fabulous day celebrating. What a fabulous party! 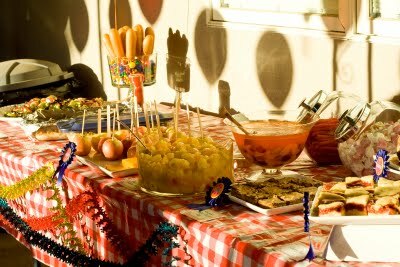 I love all the details and decorations and treats and games. As a fellow Minnesotan, that party looks perfect! I've lived away from Minnesota for most of the last ten years, so I know it doesn't matter how long you've been away. I'm heading back next week for the Fair and can't wait!! Sounds like it was a great time! 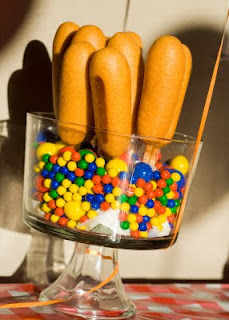 I am dying over those corn dogs in that candy bowl! SO cute! Fun party! 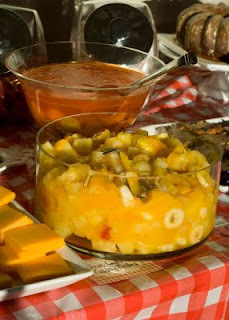 This is so awesome, I'll be sure to share it with my Minnesota boy this evening! Are you sure?! He doesn't look 60! It was a perfect party for a guy from MN. Happy birthday to him. How fun. My best friend is from Minnesota too! Ya sure!!!! 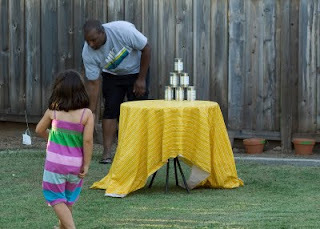 What a great idea for a fun party to remember!! Thought of you, and wondered where you might live, as we drove through Fresno the other night! What a great party! How wonderful to honor Mark with a surprise party perfectly suited to him. It looks like the weather cooperated too! 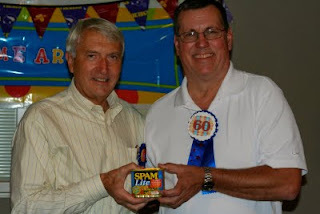 2012 is the year for 60 birthdays around here....your theme is great idea. 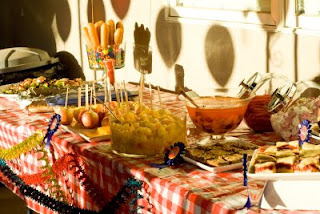 What a clever theme party! Very creative! Looks like you had a great time. Very nice!